A compact growing form noted for its early flowering. The soft grey brown seed heads contrasting well with the autumnal golds and yellow of its changing foliage colour. 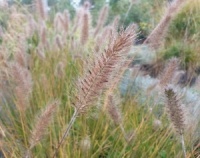 A clump of rough looking grass that hides its real beauty until the autumn when it produces lovely tall slender spikes topped with long white flower awns. A medium sized grass with attractive broad pleated leaves from which erect flower plumes each with attractive pendent green spiklets. Prefers a sheltered position with a little shade. 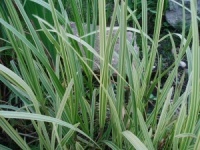 A very reliable grass often known as 'Gardeners Garters' Conspicuous white striped leaves during summer a good foil to purple leaved plants. In winter the foliage turns an attractive light browny buff colour. Produces more distinct colouring than the straight form with a slight pink tinge to the new foliage. Easy to grow and not especially fussy.